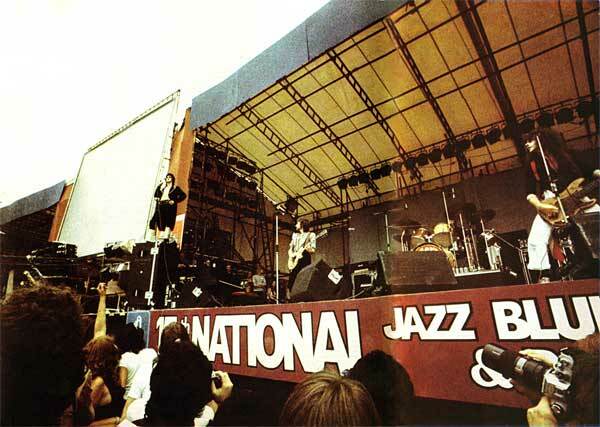 National Jazz ,Blues and Rock Festival. Unfortunately , for some reason, Richard and Linda Thompson did not appear. Hawkwind were a perennial festival favorite, still on the bill in 1986 and beyond, but it is rather strange to see Wishbone Ash topping the bill over the likes of Lou Reed and the Mahavishnu Orchestra, but they were a fairly big drawcard for the UK progressive crowd in 1975. Thanks to Theo Tieman for the copy of the festival ad . Yes - accompanied by a great lightshow, but by 1975 a hint of instrumental over indulgence had crept into the act. 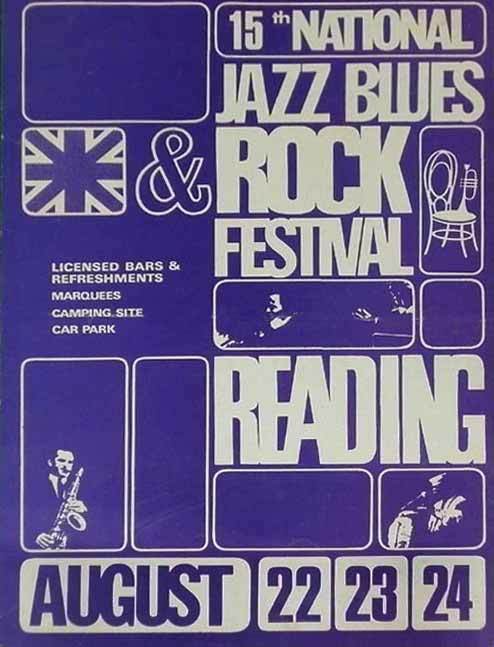 One of our correspondents believes that he saw Baker Gurvitz Army play at a Reading festival , probably 1975, its could not have been 1974 as they only formed in Sept 1974. 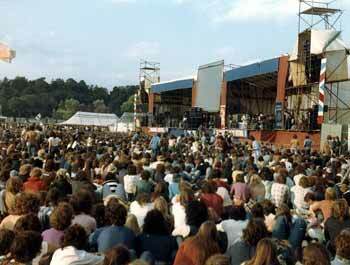 We know the band played at Reading university earlier in 1975 as a recording exists of that show. Its possible the band were a last minute substitute for another act, can anyone confirm ? 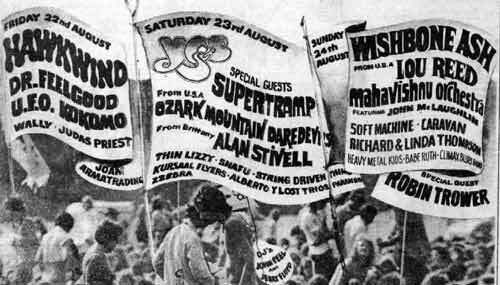 This was one of the stronger line-ups of the middle 70s and apparently one of the biggest ever crowds. According to some accounts, there was "a rain of cans and bottles after every act." This was turning into a festival tradition one could do without. A mass of bikers showed up , Lou Reed was billed to play but did not show. Some great bands , but the atmosphere was not as convivial as it once had been , similar festivals at Knebworth, Watchfield and Windsor were much more friendly events . I never went back after '75 because the can fights got a bit silly - despite the fact that I have ended up living about a mile from the site. I was a bit disturbed to see a picture of Babe Ruth - my girl friend ran off with Steve Gurl (key boards I think)! He was rich, handsome and famous - I can't think what she saw in him!! The view from backstage - Trower , Mclaughlin and Fripp. 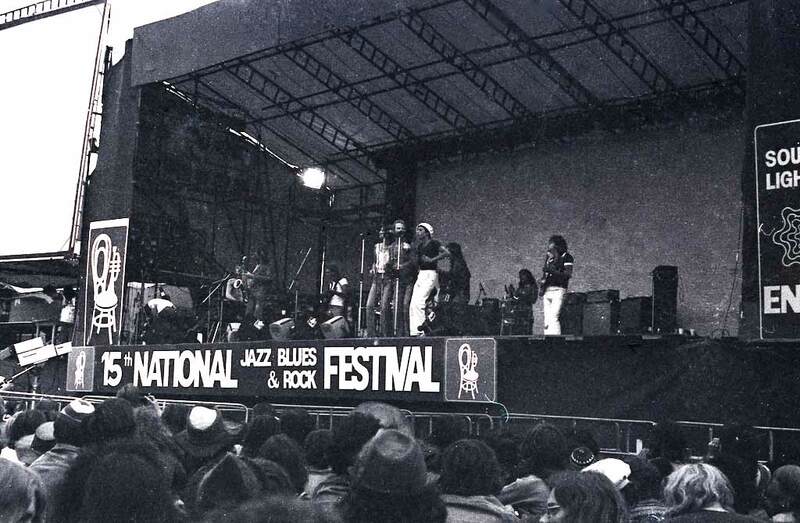 EVERY YEAR, for an impossibly long time, an enterprise called the National Jazz Federation has run some kind of festival somewhere in the Home Counties. This has I always been a frankly commercial enterprise, catering for traditional-jazz fans during: the trad boom, Pop lovers during the pop explosion and, since then ,rhythm and blues, psychedelic rock, heavy metal, glitter, or whatever else promises to draw the maximum crowd commensurate with the space available. The NJF runs a tight ship. 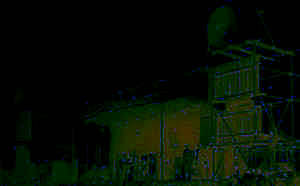 The site is always surrounded by sturdy barriers and patrolled by security men; very few people get in without tickets.Lavatories are adequate, the camping area as neat as a RAF base, purveyors of food are under licence and what they charge, while inflated, is controlled to some extent. When the music finishes , and it finishes on the dot, the site is cleared with surprising if brusque rapidity. I've sung for two years at Reading, the current home of the festival, and its a very pleasant occasion for the artist. Cut off from the public by impenetrable barriers of corrugated iron, we wander an enclave where a drinks tent, the hospitality caravans of the record companies, the food stalls offering delicious Jamaican patties and Greek sweetmeats, the French cafe tables with their umbrellas, all combine to make life very bearable under the wide blue sky. Everybody in there - performers, Agents, PROs, the Press, carefully blasé groupies -have run a vigorous security check and either wear or carry some identifying badge. I don't see that anyone who pays to go to the Reading festival can complain, as they know exactly what they're getting; the acts as advertised at the times promised and an atmosphere, authoritarian certainly, but reliable and orderly. Nevertheless, Reading is in no way a survival of the legendary pop festivals of the sixties and was indeed never truly part of them. The Isle of Wight, Glastonbury, these were the great manifestations of the alternative culture of love, dope, sounds, macrobiotic food, tripping, instinctive anarchism, youth, the new life style. The last bastion of all that was the free festival at Windsor last week and anyone rash enough to prefer to go there was at risk. Free food, free music, people peeing in bushes and poking whatever and poking wherever and whenever they felt like it, and on Royal ground too and without permission - there'll be no more of that ! So the law moved in with truncheons and shut the whole thing down. But why? Why do they hate freedom so much? Why, now that the moment of youthful hope is dying, do they find it necessary to stomp on its last moribund manifestations ? They are nothing like as fierce about football hooliganism -do they think that it's more manly, more easily channelled into violence under licence for the benefit of an increasingly intolerant society? My middle-aged body was well nourished and well paid to be in Reading. My spirit mourned for Windsor; the pathetic and perhaps the last manifestation of peace and love. 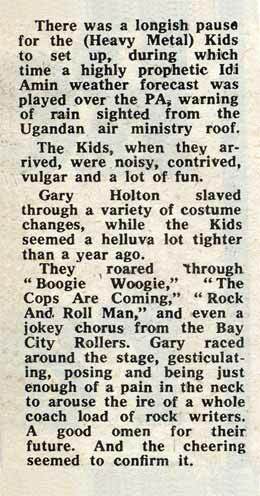 The article above by George Melly , although written about the 1974 bash , I think sums up the festival to a T . It was never really part of the underground, which allowed it to assume some respectability and avoid some of the organisational mistakes made by the more aggressive promoters of the time. Overall, one has to say that the festivals were at times great events , but never legendary, because they were so tightly run and took so few risks .Of course, they still prevail , unlike Bath and the Isle Of Wight , but after 1970, I don't really think they were significant artistic events , but then , there weren't very many other festivals that that could be said about either after 1974, apart from Glastonbury and the free festivals. 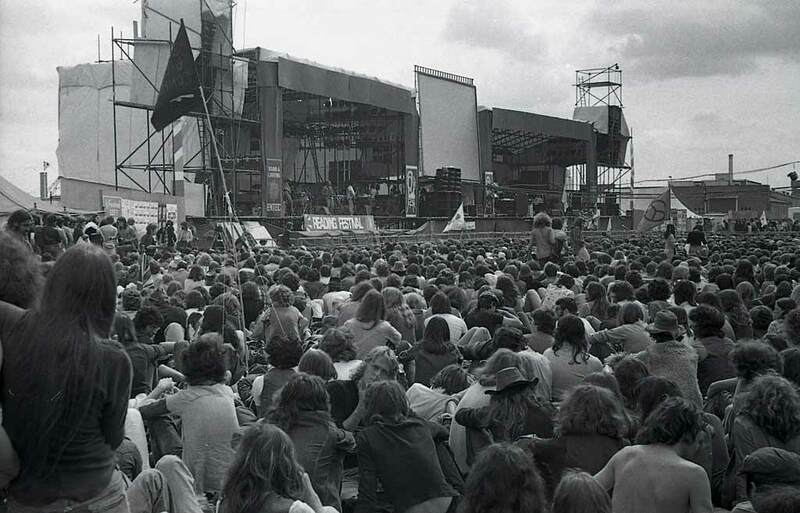 Although you could go to a major festival and have fun , the rules that had to be followed by the promoters , the sheer logistics involved in putting them together, combined with the change in mood of the audience , growing commercialization and sheer scale of the things , meant that the feelings of unity, tolerance and peace that could be achieved at a major Rock festival had largely evaporated by 1975 and the only places I've found them to be present at since are at small scale folk festivals and Womadelaide.